Masrani helped Canada’s second-largest bank weather the storms of 2008. Can he keep his cool for what’s coming in 2019? Since Bharat Masrani took over TD, the bank's adjusted income has soared 50%. Bankers like predictability, and a few things have stayed unchanged since late in 2014, when Bharat Masrani became the first person of colour to run a major Canadian bank. At the time, TD was the second-largest bank in Canada, and it remains so. Masrani’s unassuming middle-management wardrobe eschewed flashy cufflinks then, and his shirts continue to be buttoned at the wrists. And more than four years after his newsmaking ascendance, Masrani is still the only example of diversity at the top of Canadian banking. Aside from all of that, things look very different. Banking has gone highly mobile. The economy appears tilted toward recession. Interest rates are climbing as oil has plunged. And there’s a destabilizing narcissist in residence at the White House who seems intent on cooking up trouble. None of that has unsettled Masrani. Since he took over, TD’s adjusted income has soared 50%, and Masrani’s calm demeanour suggests everything is fine. For the man who helped TD weather the storms of 2008, maybe there’s nothing more predictable or manageable than chaos. Why did the stock prices of all the banks struggle so much in 2018? Banks are a reflection of what happens in general economies, and there are a lot of macro headwinds in the world, such as trade, what’s happening to global growth, Brexit. In Canada, we’ve seen some numbers that would suggest that perhaps there are real issues. There are views emerging that we are in for a volatile period here. I think that is reflected in the valuations you see. In a recent interview, you said, “We enter the new year with good tailwinds in our business. The economic prospects in Canada and the U.S. are positive.” Have you changed your view? I have not changed my view. You are asking me why the markets are behaving the way they are. From a tailwinds perspective, look at what has happened in the past year. Economic growth has been strong in the U.S. and Canada, which is where most of our businesses are. Interest rates have started to normalize, and for banks, that is positive. If you look at unemployment, there are very strong numbers in both the U.S. and Canada. So there’s a lot of momentum on our side. But that doesn’t mean there are no headwinds. Do you see specific challenges ahead? Trade is the worrisome one. There are real issues with respect to China, for example, on technology transfer, intellectual property. But a prolonged trade war is never positive. I think that is a big headwind going forward, and my hope is that sensible minds prevail. “Sensible minds"—that’s asking a lot of the Trump administration. Listen, there are stylistic issues. Economies work in different ways. The U.S. is a major economic engine for the world. I’m so glad we have a trade agreement that is refreshed now. There are chapters in the USMCA (see footnote 1, below) that make sense that did not exist before. What do you expect regarding interest rates in the coming year? Normalization is good. What is the new normal—the ideal interest rate that allows for very good employment, and deployment of an economic system versus inflation? I think that is what the world is searching for. If we go too high and too quick, it's going to be negative. For any bank, very high interest rates are not good because they cause our customers and the companies that bank with us to suffer. So I worry about it. And I think there is still more to come by way of normalization. You spoke recently of there being “a benign credit environment.” But consumer debt levels are very high. Do you have any concerns? Consumer debt as a headline number is high. But a lot of the Canadian consumer debt is in mortgages. The mortgage regime in Canada is a lot different than in the rest of the world—what kind of down payments are necessary, the interest rate risk financial institutions assume. You said it’s different. How would you characterize it? It’s better. It’s more sustainable. You know, at TD, mortgages are the biggest asset class on our balance sheet. I think that’s a positive for the Canadian system and economy. More than indebtedness, I think if the unemployment number starts to inch up, that would be a big indicator of potential problems in the economy and, frankly, potential losses. Regarding mortgages, you and Ed Clark smartly got out of mortgage-backed securities prior to 2008. TD used to be a major player in the business of “structured products” (see footnote 2), and thankfully we decided to exit. I don’t think we could have predicted the whole world was going to fly itself into a mountain through those products, but that’s what happened. And we were out of it. That allowed us to build out our U.S. business more quickly, because other banks were otherwise occupied. 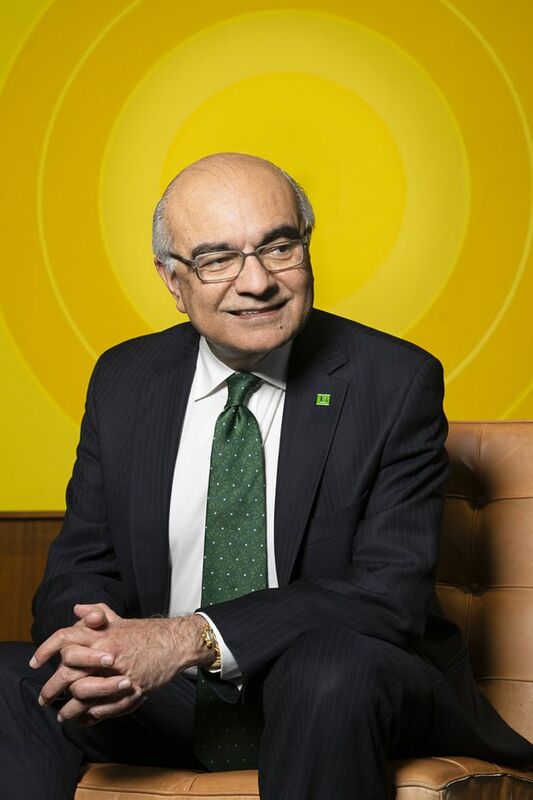 In 2014, Masrani became the first person of colour to run a major Canadian bank. Do you think that decision is one of the reasons you’re in the seat you’re in now? GM recently announced the closure of its Oshawa plant. What do you think about the future of manufacturing in this province? Of course there is concern. It is a terrible thing for any community to go through. But our system has a way of transforming itself, and some new jobs will appear down the road. Many years ago, folks would not have thought of Toronto as a hub for artificial intelligence engineering talent, and today it is a major, major centre. Our system, with democracy and openness, produces terrific ideas that turn themselves into big industries. I’m confident that will happen. Let’s talk about oil and gas. How much has TD reduced its exposure to the energy sector since 2016? Our exposure is less than 1% of our total gross loans. So that is not a big issue. I think it’s the second-order effects we should look at—what happens to individuals when jobs are lost, GDP and all that. All those issues, from a TD perspective, are manageable. But that doesn’t mean this is pain-free. So you are focused on the current state of the oil patch and what they’re going through? Of course I am. At TD, we are all for the low-carbon economy. We multiply our lending to that area. We are one of the largest green-bond issuers. I think we are the only Canadian bank on the Dow Jones Sustainability World Index. But we also acknowledge that trying to get there instantly is not feasible. You’ve talked in the past about TD’s “unique” culture. What’s unique about it? It’s a unique and inclusive and performance-driven culture. Diversity plays a big role. As a bank, we don’t make anything. We don’t make cars; we don’t make computers. Our business is based on people. So, for us it’s a very serious matter. We think driving a very positive culture is not only the right thing to do but also the only way to be successful. How does the notion of diversity manifest itself at TD? We start with the premise that, of course, it’s the right, moral thing to do. From a business perspective, unless we reflect the communities we serve, we will not be as successful. Unless we have the best talent out there, we will not be successful. It goes right through our training programs, our leadership development programs, what targets we set. Look at how many women, for example, we have on our board. I am very happy with the progress we’ve been making. On the retail side, more than 80% of TD transactions take place via mobile apps or online, but one of your key initiatives has been to invest in physical branches. Why? Listen, every new channel that gets introduced, people love it. And it multiplies the number of transactions. I’m happy to report we are the largest digital bank in Canada. And we are rated No. 1 by App Annie, which is the industry standard. But 70% of our customers in Canada visited a branch in the last little while (see footnote 3). And what we do in our branches, how those branches look, the type of service we provide, the level of advice we provide, is a lot different than it used to be. Does that mean more branches? More people in the branches? Different functionality? The physical nature of the branch is changing. You go to some TD locations and say, “Really? This is TD Bank?” There are branches in Canada, for example, where there is no cash! There are stores in Manhattan where there are no humans. [Chuckles.] This is what customers want, so we will adapt. And there’s a science to it. How are the needs of customers changing? They want to touch the bank in the way they prefer to touch it. So they want the best digital experience. And when desired, they want a branch interaction. And there, people want more than a transactional relationship. They want more information, more advice. The issue of confidence is playing an increasingly important role. Am I confident of what my needs are going to be down the road? Let’s talk about succession. When Ed Clark was CEO, he saw you as somebody to groom for an eventual rise up. Did you talk to him? According to research I’ve done, he targeted you (see footnote 4). Well my question is, are you doing that for someone else? You know, succession planning in a bank of TD’s size is always an important issue—at every level in the organization, not just my role. It’s a big board responsibility. It’s an ongoing exercise, and I think our bank does a pretty good job at it. You don’t want to tell me whether or not you’ve got your eye on someone? That's for you to find out. According to Foreign Affairs Minister Chrystia Freeland, Canadians should be referring to the new trade deal as CUSMA. In Mexico, it’s called T-MEC: el Tratado entre México, Estados Unidos y Canada. “Structured” products include such things as complex derivatives, collateral debt obligations (CDOs) and CDO-squared products. And 80% of new TD customers still come in through its branches. One source was a 2014 Report on Business magazine story called “When Ed met Bharat," by Tim Kiladze. Trevor Cole is the award-winning author of five books, including The Whisky King, a non-fiction account of Canada’s most infamous mobster bootlegger.